This chapter focuses on pediatric high-grade gliomas, with the exception of diffuse intrinsic pontine gliomas, which will be covered in a different chapter of this text. Gliomas arise from glial cells, which support and protect neurons and are most commonly differentiated along the astrocytic or oligodendroglial lineage. The World Health Organization (WHO) classification divides gliomas into low (WHO grade I and II)- and high-grade subgroups (Luis et al. 2007). 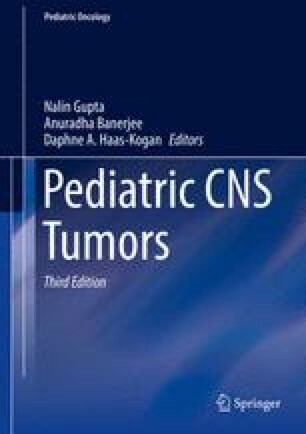 High-grade pediatric central nervous system (CNS) tumors are comprised primarily of anaplastic astrocytomas (AA, WHO grade III) and glioblastomas (GBM, WHO grade IV), as anaplastic tumors with an oligodendroglial component are very uncommon in children (Hyder et al. 2007). High-grade gliomas can either present as high-grade disease, or they can result from transformation of a low-grade tumor, although the latter is less common in children. In contrast to the adult population, high-grade gliomas in children are relatively infrequent, representing less than 20 % of cases (Pollack 1994; Packer 1999). The etiology for most pediatric CNS tumors is unknown, although some genetic syndromes are associated with an increased risk. Despite advances in treatment for other childhood tumors, patients with high-grade gliomas invariably have a poor outcome, and 5-year survival rates remain less than 20 %.